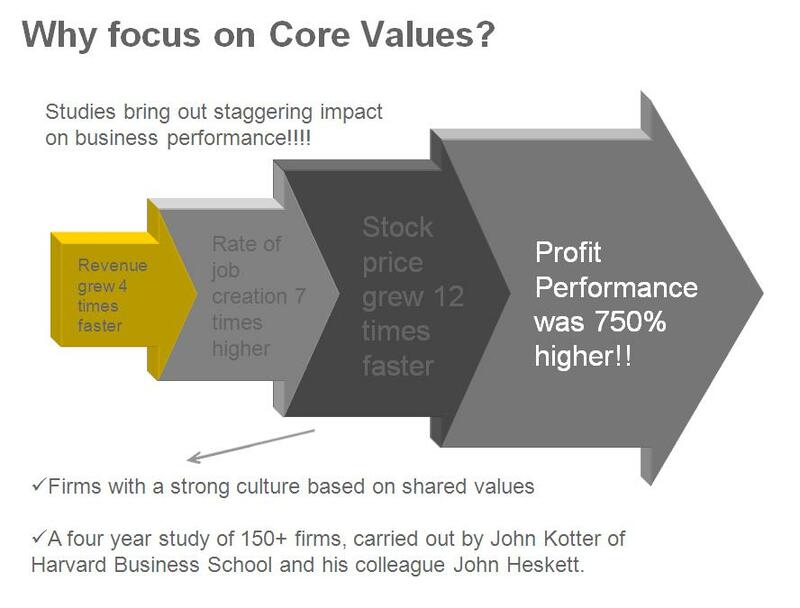 Thank you for the feedback on the previous post on values, quite a few of you had come back with questions on the impact of values on organizational performance. One of the other popular questions that we hear is “Our organizational core values are not clearly defined. How do we go about doing that?” Let’s try to address that. First things first, core values are not what you want your organization to have, it is what the organization already has – as part of its fundamental structure. Jim Collins talks about a few interesting value defining exercises in his website, Aligning action and values. You can also watch some very interesting video/audio on the same subject here. It is good to have your people practice the core tenets of integrity, collaboration and teamwork, but if those are the organization’s core values, there is a need to drill down deeper to understand how these represent what the company stands for in its most fundamental form. One of my favourite examples of companies deriving their core values from ground up is that of Zappos, where the CEO started by sending out an email to all employees asking them about their personal values and then working with members of the leadership team on getting common elements from their views, which represented the company’s core values. Zappos CEO Tony Hsieh talks about the importance of company culture in the below video. You can read about the core values that Zappos came up with post this exercise at the link. Needless to say, this is virtually impossible when you are running a multi-billion dollar enterprise with thousands of employees, which makes it all the more important to think about and put down the organizational values at the beginning of the journey for an organization. One exercise which has been used popularly to get people to think about organizational core values is to visualize an employee in your organization, who is a high performer/achiever and is one person looked up-to in the organization as a role model. Think about some of the actions, behaviours and values that this person represents, and you could have a good starting point on your path to defining the organizational core values. Coming to the part about whether all this adds value to the company bottom line, or is just mumbo-jumbo that is a tick in the box while defining HR policies(never to be reused! ); you only need to take a look at some of the recent research done on the subject by management experts. One such study done by Kotter and Heskett, came up with some staggering figures about this. A summary of their findings after studying over 150 companies is as below. Their book on the subject is a must-read for professionals interested in gaining a better understanding of the importance of shared values in an organization. So do you live your shared values every day in your organization? Do share your thoughts as well. This entry was posted on January 18, 2012, 2:10 pm and is filed under Core Values, General, Leadership, Team Effectiveness, Uncategorized. You can follow any responses to this entry through RSS 2.0. You can leave a response, or trackback from your own site. "Not finance. Not strategy. Not technology. It is teamwork that remains the ultimate competitive advantage, both because it is so powerful & so rare”- Patrick Lencioni, noted author. While most leaders appreciate the above truth, the hunt for this "elusive elixir", is by far one of painful difficulty. This blog on teamwork is intended to be a forum to gather the collective wisdom to help each one of us craft better teams and be better team members. Do join the conversation.